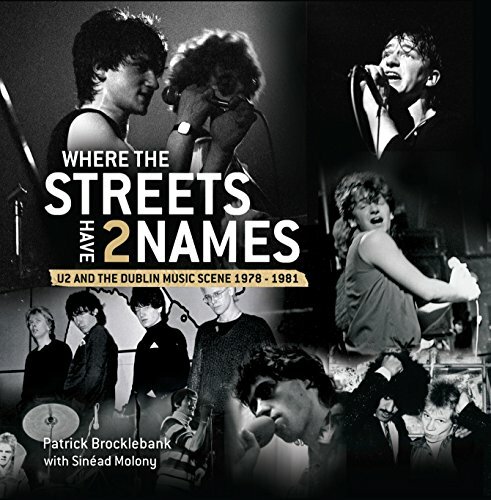 "Where the Streets Have Two Names" by Patrick Brocklebank and Sinead Molony is a fascinating account and history of the music scene in Dublin in the 1970's and 1980's. U2 Band was at its beginning and its peak during these years and the songs were about the places and streets around them, so that them are immortalized with U2 names, but familiar to all who journey there. This history has many wonderful stories about U2 and other musicians of that period and especially in and around Dublin and their other performance venues. If you love music, you gotta read this book! Where the Streets Have 2 Names: U2 and the Dublin Music Scene 1978-1981 features hundreds of previously unpublished photographs of U2 (by award-winning photographer Patrick Brocklebank) from the band's very early days before they became the global phenomenon we know today. The book includes numerous untold stories about the band members and other groups who were part of Dublin's music scene from that time, including the Boomtown Rats, the Virgin Prunes, the Blades and the Black Catholics (who made a habit of disrupting U2 gigs), and focuses on artists, such as Guggi, who began to make their mark at that time. There are also wonderful stories about the long-gone music venues of that era, such as the Dandelion Market. Where the Streets Have 2 Names is both a celebration of an iconic band and a superb evocation of the Dublin of thirty years ago, it is a must-have gift for all U2 fans and music lovers.